1. Trump rally: U.S. stocks closed at record highs again on Thursday -- but will the rally continue? 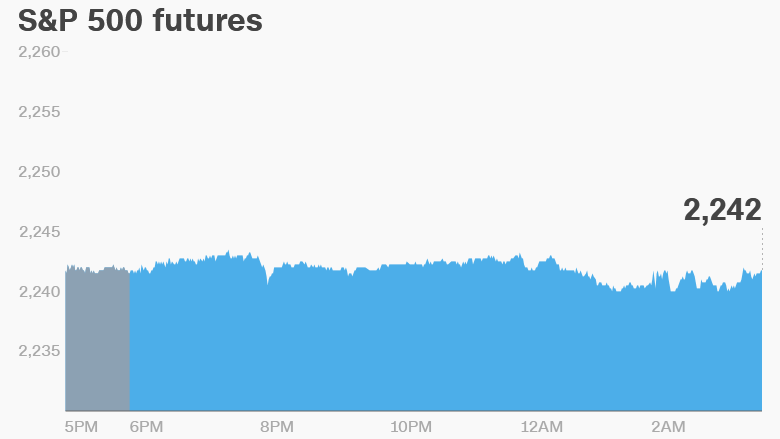 U.S. stock futures are steady, and investors appear to be satisfied with taking a breather for now. The Dow Jones industrial average and S&P 500 have each jumped by more than 2% so far this week. The Nasdaq is up more than 3%. 2. Global market overview: Stock markets around the world aren't making any big moves. European stocks are mixed in early trading. Italian and Greek markets are each off by about 1%, but other indexes are sitting pretty. Asian markets closed the week with mixed results. One standout performer was Japan's Nikkei, which jumped 1.2% to just below 19,000 points. However, that's still below recent highs set in 2015 when the Nikkei was trading around 21,000 points. 3. This deal is bananas: Irish banana company Fyffes has agreed to a takeover offer from Japanese conglomerate Sumitomo. Shares in the banana company surged after the announcement. Rival banana firm Chiquita had previously been interested in buying Fyffes, but the deal was never completed. 4. Post-election pop in consumer confidence? : The University of Michigan's consumer confidence index is being released at 10 a.m. ET. U.S. consumer confidence rose sharply in November and the new figures are expected to show the good mood continued in early December. The stock market's record-breaking performance should probably help.